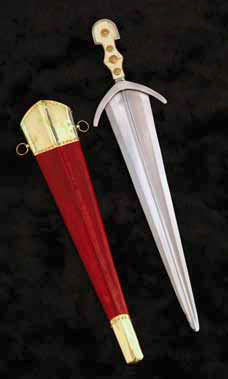 The cinquedea is a civilian short sword. It was developed in northern Italy and enjoyed a period of popularity during the Italian renaissance of the 15th and early 16th centuries. This recreation of the cinquedea features a wide, triangular blade with a rounded point and a shallow yet wide fuller, which is bisected by a ridged spine. The curved guard angles towards the point, with its concave section fitting the blade, while the ornate hilt features brass disc accents along its length. The blade is made entirely from fine steel, and it includes a leather-wrapped wood scabbard that features brass fittings at its throat and chape, as well as wearing rings on either side. The cinquedea is a civilian short sword. It was developed in northern Italy and enjoyed a period of popularity during the Italian renaissance of the 15th and early 16th centuries. This page was last modified on 28 September 2013, at 19:50.